NASCAR Sprint Cup driver Brad Keselowski isn’t happy about his retired competitor’s on-air portrayal of yesterday’s pit stop snafu at Pocono, reports Racer. Keselowski lashed out at Fox Sports commentator and recently retired Sprint Cup racer Jeff Gordon for allegedly being biased. They need to get some people that aren’t inbred to the sport and own teams and have internal knowledge, because that is pretty crappy. It is what it is. It’s not that I don’t like Jeff Gordon in the booth, it’s just that you need to have people in the booth that don’t own teams or have commercial interests in the sport, because they say things that are very biased. 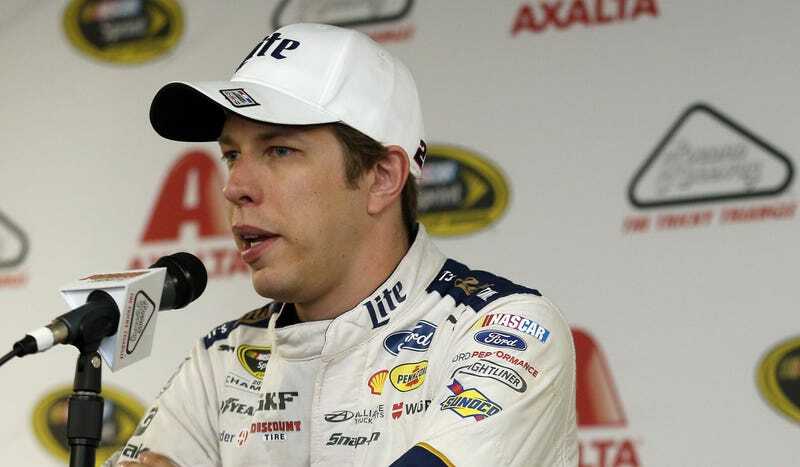 Keselowski may be speaking while irritated, but he’s got a point. Gordon is a majority owner of Jimmie Johnson’s No. 48 car and drove the No. 24 car for 24 years, notes Racer. Both No. 24 and No. 48 are Hendrick Motorsports entries; Keselowski drives for Team Penske. Keselowski was particularly raw about Gordon claiming that his No. 2 team had been penalized earlier this year for the same kind of illegal “body modification” (read: sideforce-improving dent via bodyslam) to the side fender at Las Vegas Motor Speedway this year. Keselowski’s No. 2 team had been penalized for that at Las Vegas before, but that was in 2015—not this year. This year’s penalty at Las Vegas was for speeding in the pits, not denting in the fender. No reporter, commentator or talking head is ever truly without bias, however, maybe it does need to be more out in the open as to who’s still connected to what team.